Changing the World One Heart at a Time! That is the goal of the new Hearts For Hearts Girls doll line and fashion collection from Playmates Toys. The collection features six dolls from around the world, each with an inspiring story to share. To further bring to light each Hearts For Hearts Girls’ culture, additional outfits are available for the dolls, so that your little girl can envision her doll’s story as she plays and changes the doll’s attire. 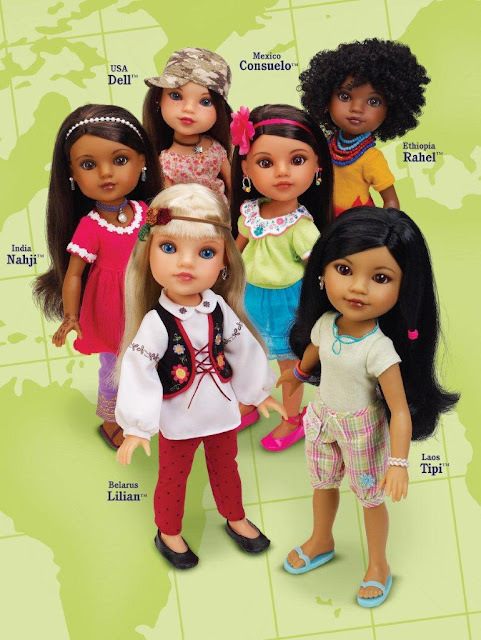 Additionally, through a partnership with World Vision3, a portion of the proceeds from the sale of each Hearts For Hearts Girls doll is donated to programs that support girls in that doll’s country. Whether it’s malaria nets in Africa, schoolbooks in Asia, or food supplies in the United States, these programs help girls to thrive and succeed. Meet Consuelo from Mexico City. Colorful and warm, Consuelo provides aid to hungry children who are homeless and live on the streets near her parents’ bakery. Meet Lilian of Belarus. Determined Lilian provides aid to girls whose parents must find work in the big city and are forced to leave their children with orphanages. Meet Dell from the heart of Kentucky’s Appalachian Mountains. Dell creates music and knitwear to share with others in need of warm clothing. Meet Rahel of Ethiopia. Rahel, who dreams of becoming a doctor so that she can make a real difference for people in her region, journeys with her family into the wilderness of Ethiopia to help bring back aid to her community. Meet Tipi from Laos. Based on a real girl who shares her art and storytelling with others through dancing, drawing, and puppetry, Tipi leads her school in a mural contest in hopes of winning much-needed books for her class. Meet Nahji who hails from Assam, India. Brave Nahji breaks tradition to bring courage and education to the girls who work in the tea fields of India. MyBlogSpark sent me one doll (Tipi) and clothing/accessories (Dell) set to review with my daughter. I wanted to surprise my daughter and boy did I! Apparently she had already heard of this doll from a friend and she was hoping she would receive one for Christmas this year. As she opened the box she started giggling and shrieking, she was in shock! I bet these dolls will be on a lot of little girls' Christmas lists this year. What a positive message these bring, that is the best part for me because I work hard to bring my children up in a positive environment and we are trying to teach them to help out others. I love that these dolls help to encourage girls to step up and make a change, help others and care about others. I don't know if it was a mistake to get the clothing and accessories set for another doll but they were cute and my daughter dressed Tipi up right away. The hair on the doll was high quality, it almost felt real! I combed it for her and put it in a little topknot type bun, it looked cute. The arms and legs can twist all the way around, now that is flexible. The head tilts and moves very naturally too. The clothing and accessories were high quality as well, made to last and perhaps be passed on to another little girl once my daughter gets too old to care for dolls. The bracelet was her favorite thing, she couldn't wait to put it on and wear it to school so she can tell her friends all about her new doll. Changing the World one at a Time! One Hearts For Hearts Girl, accompanied by a friendship bracelet, story booklet, donation for girls in need through partner World Vision and a special product code your daughter can use to unlock a free membership to the Hearts For Hearts Girls website, which provides access to the “myHeart” page and an array of games and activities. Disclosure: Special thanks to Playmates Toys and MyBlogSpark for providing me with samples to review from Hearts For Hearts. I did not receive monetary compensation for this review. I was sent the product(s) free of charge by MyBlogSpark. It has been used solely for the purpose of this honest review. The views are strictly 100% my own. Receiving the product did not influence me to produce a positive review. The product, information and prize pack have been provided by Playmates Toys through MyBlogSpark. Prize pack will be sent by MyBlogSpark. Giveaway begins at 12:01 am on 9/25/2011.